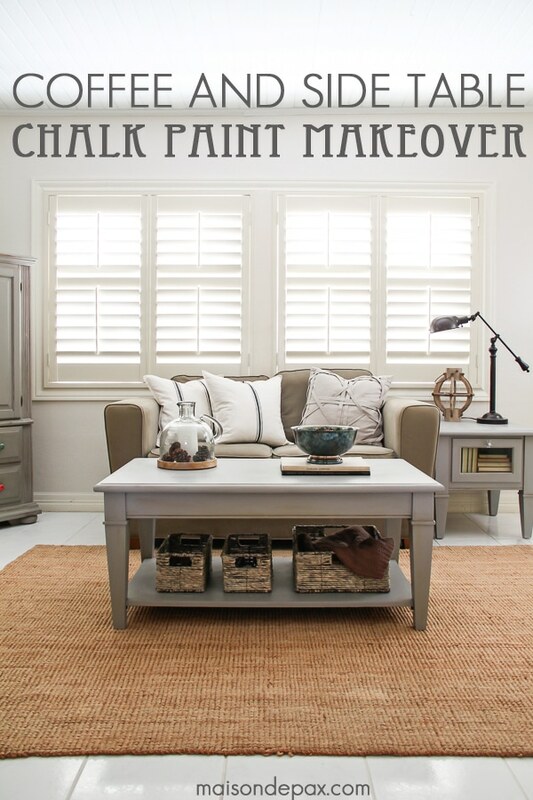 Be sure to scroll down to the bottom to see 5 other incredible makeovers and to enter to WIN $150 worth of furniture makeover products! Not sad (most of the time 😉 ), just drawn to blues. I wear a lot of blue, and I love using blue in my home. So when I decided to sell the red dresser, I knew that either blue or gray was in my future. 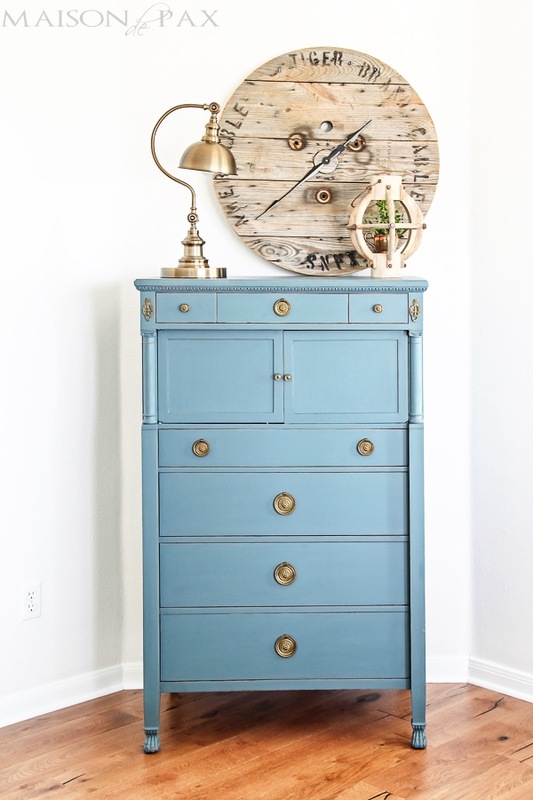 And when I found Homestead Blue by Fusion Mineral Paint, I was sold. Now before I go on, I have to brag on Mr. Pax for a minute. I found a dresser on Craigslist the week before I left for the Haven Conference in July, but they sellers never showed up. So the night before I left, he told me to try to find another one. I did. But I was leaving early the next morning. So Mr. Pax not only took off of work to keep all three kids in a new home and city (we had only lived there about 10 days at that point), but he moved all the car seats to the truck and took all three kids across the city to pick up this dresser for me. This beautiful dresser needed some love, though. For some reason, the varnish was horribly scratched. It look like cats had lived on top of it for years and clawed their way up there each night. It would have taken pounds of wood filler to level out those scratches, so I sanded the dresser smooth before I painted. I have used this paint on other pieces, though (like the magazine holder I recently painted white) and with no sanding and basically no prep at all, it worked like a charm. The best part, though, is that while it adheres like chalky paints, it is acrylic based and therefore needs no top coat. I’m telling you, this paint is WONDERFUL… And you have a chance to win $150 worth! It is easy to distress (though I do recommend you do it soon after the piece is dry to the touch), and I didn’t have to wax, varnish, or poly it. Win. After lightly distressing the edges with some 150 grit sandpaper, I just stuck the gorgeous original hardware back on it and called it done. The original finish was a very purple mahogany look, so I was happy to paint the piece. I did, however, leave part of it the original color; I love the contrast between the new blue and some of the old finish. I’m excited to show you more of our master bedroom soon (i.e. as soon as I do more than paint it… it is currently a white box with a blue dresser). 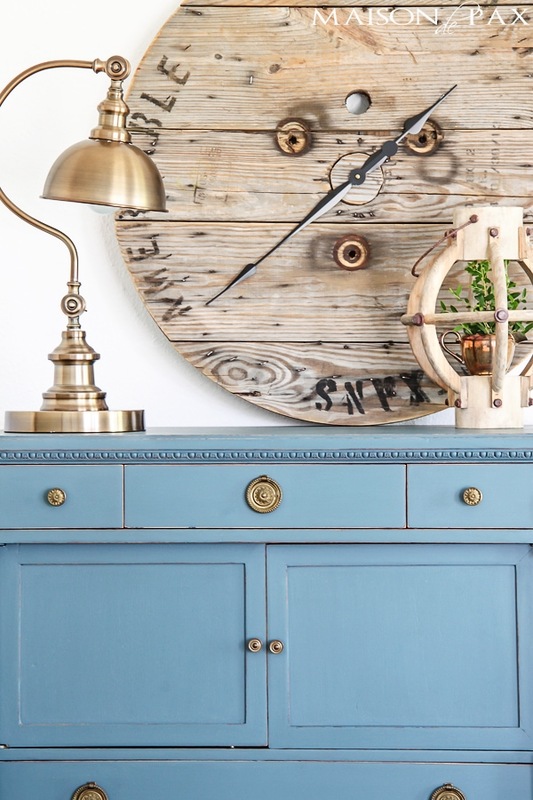 But I’ve got plans, as always… 😉 And in the meantime, go visit these other amazingly talented bloggers and see their furniture transformations. I’m sure you’ll be inspired! Disclosure: A special thanks to Fusion Mineral Paint for providing the paint for this project! All opinions and text are 100% my own; you can see my full disclosure policy here. i love the color Laurentein! I have got to try this paint. Your dresser turned out terrific. That is a very pretty shade of blue. I also like their colour sterling. I really like the homestead blue! It’s so pretty. I love the fusion paint in Laurentien! The colors are ALL wonderful. Casement and Sterling I really like as they are neutral and timeless! Thanks for the giveaway opportunity! This is gorgeous! I need to paint my kitchen table and chairs…would this be a good choice? Love the dresser!! What a sweet and thoughtful husband you have. The lantern on the dresser is so great. Would you share where you purchased it from? Thanks so much for sharing your inspiration. Have a great day! I’m just starting down this road of fun so this would be great. Thanks for the chance to win this. Oh, I love this look – you are very gifted at painting furniture! Could you please tell me where you got that amazing lamp? 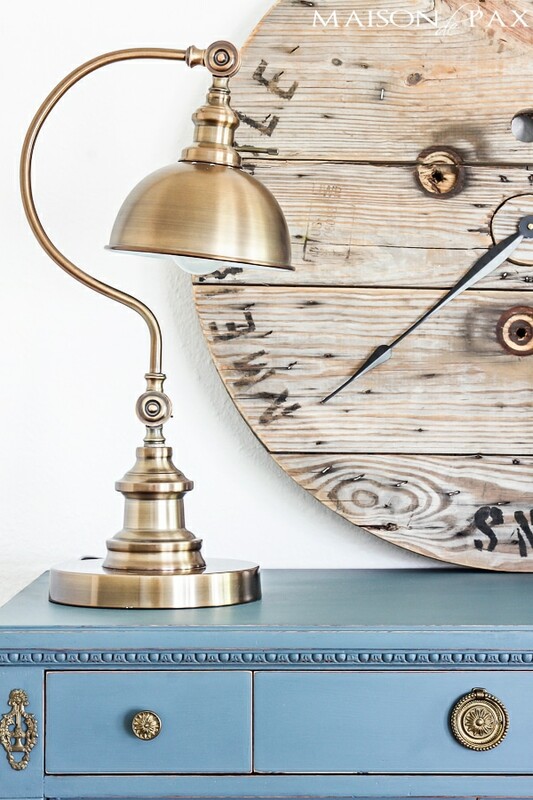 Oh, I am in love, and l love the brushed gold with the blue….blessings! What a gorgeous blue! Wonderful makeover! Although I would love to win the giveaway, I don’t really want to follow all the required sites. Love your dresser, it turned out beautiful!!!!! I like the fusion paint color homestead blue. I love the look of the dark blues, but would more likely use a neutral color like champlain on furniture. I need to get a few things cleaned up and painted and this would help us tremendously. Love the blue! Really adds dimension to the piece. This is gorgeous, Rachel. I remember you telling me that story about your hubby getting the dresser while we were at Haven. World’s best husband! I LOVE this dresser. It’s stunning. And it looks perfect in the blue. Thanks for being a part of the group today, girl! The dresser is gorgeous! I think my favorite (which is nearly impossible to choose) would have to be Inglebrook! Yes,you do have a “Keeper”,he sounds like a good husband and father. The dresser is a beautiful piece and in my favorite color.Thanks Rachel. I love the dresser. I’m going to have to try this paint, just have to go find a new piece of furniture! Your dresser is gorgeous! That hardware makes it outstanding. I love blue, too, but I’d pick buttermilk cream as my favorite. It reminds me of the cabinets at my grandparents house (and I’m 71, long memory). I’d love to paint my kitchen cabinets that color. I really like the Inglenook! LOVE LAURENTIEN!!! They are all great colors! I love the blue dresser. Gorgeous color!!! Thanks for the giveaway. 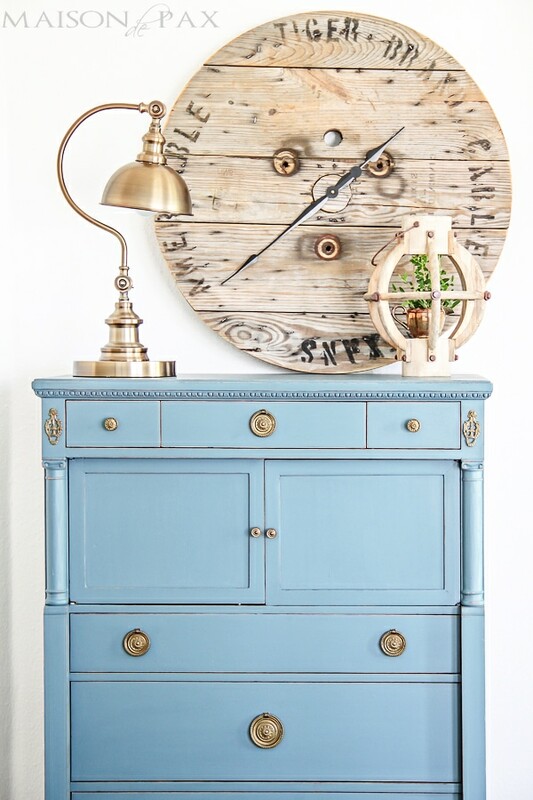 The contrast of the old and new finishes works beautifully on this piece, Rachel! Great, also, that this paint doesn’t require the extra waxing step. Thanks for sharing! “Champness” is a great color for several pieces in my home currently needing a new look! Inglewood willike complete my look in the guestroom. The dresser is awesome. I would love to try the Damask color. You sure did marry a keeper. 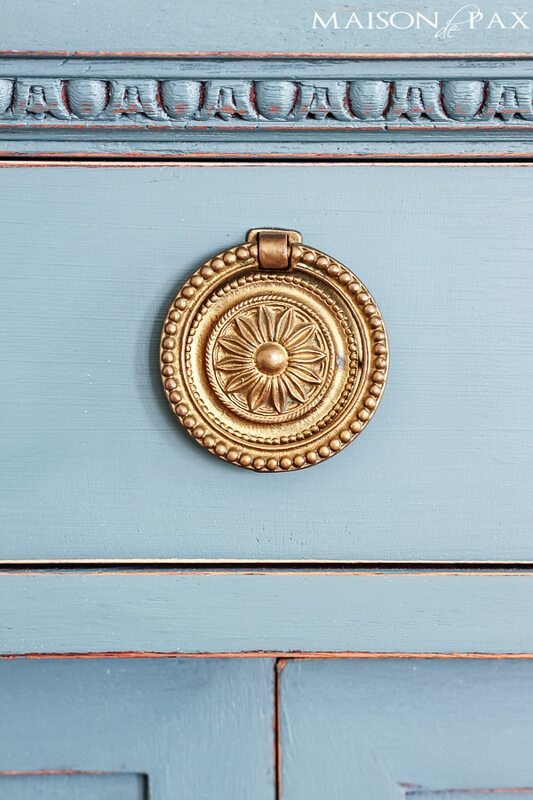 Lovely blue, lovely dresser. As always, you kick it up a notch. Love..love the blue color you used! Absolutely love that blue!! Turned out beautiful! I love this color Rachel and buttermilk would look great too. Thank you for the giveaway. The chest looks amazing Rachel! What an awesome find. So glad you had a chance to try out Fusion, isn’t it incredible? Homestead Blue is one of my favorite colors in the line. In response to one commenter above asking if Fusion is a good choice for kitchen tables and chairs . . . the answer is Yes! Fusion is waterproof and highly durable, also non-toxic so great around food. 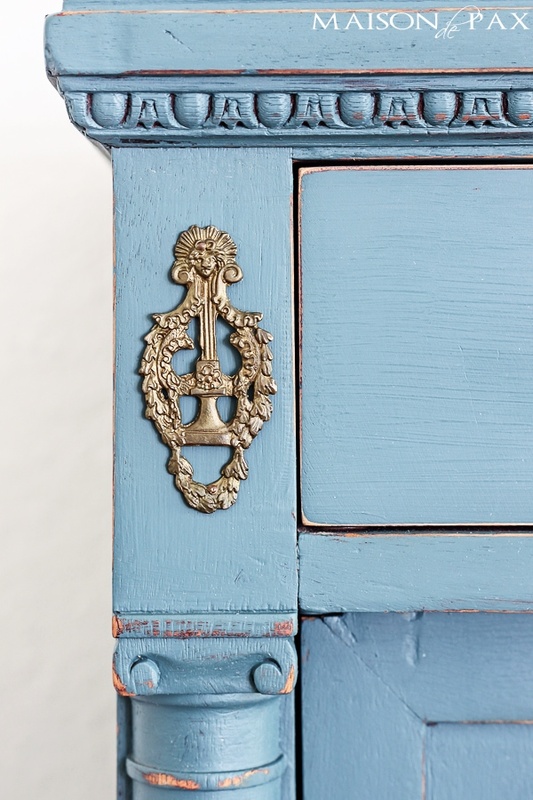 Love the dresser and the hardware is gorgeous! 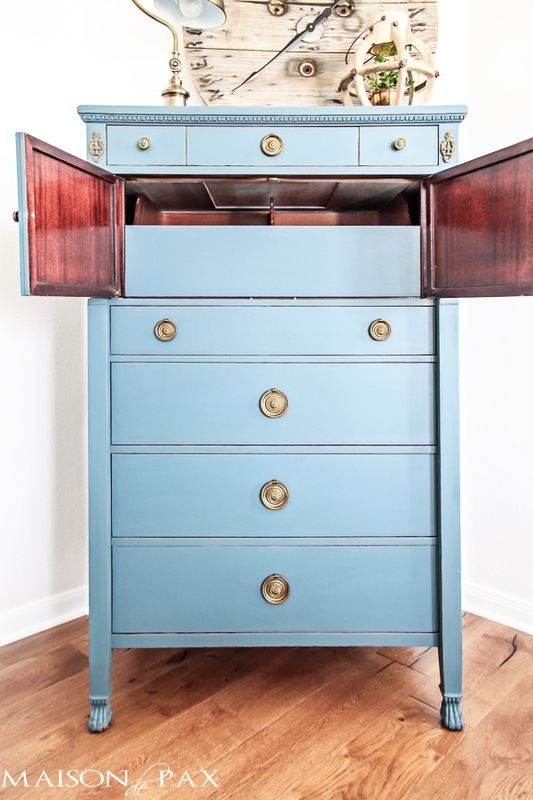 Love the blue dresser/armoire. You did a great job and I too love the Fusion Mineral paint. It’s such a great product! Look forward to seeing more of your work! That shade of blue is LUSCIOUS! Dresser looks lovely. Good choice of color. I love the homestead blue. I just bought my first batch of Fusion Mineral Paint from Lost & Found Decor’s Melanie Alexander! I got Champlain and I can’t wait to see how it looks on my desk! I love limestone and prairie sunset! No doubt about it… Prairie Sunset!!! Love yellow!!!! 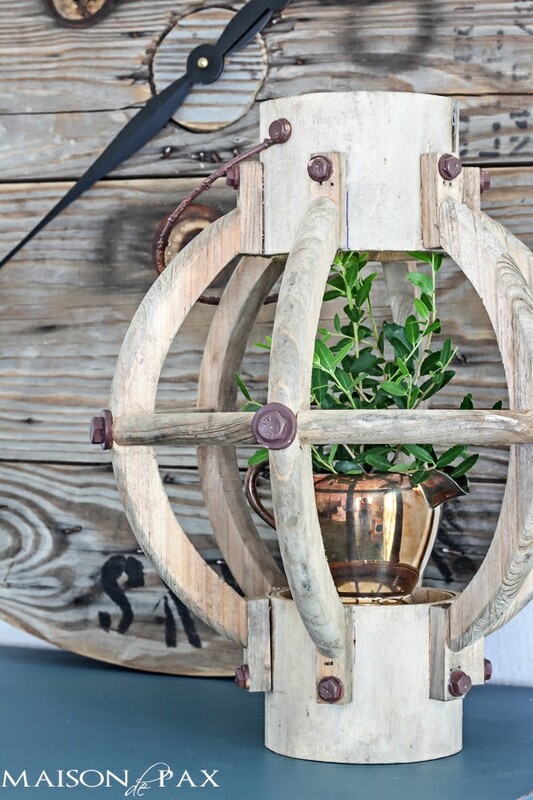 Just seeing your blog for the first time today via Southern Hospitality…. Following along as of right now!!! Beautiful chest….you did a great job!! 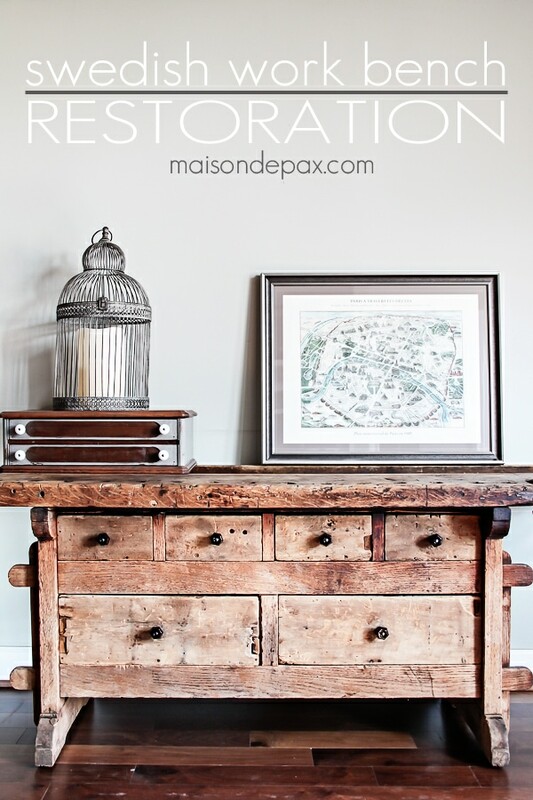 This is a awesome giveaway, I love to paint furniture!! Thank you! What an amazing piece this turned out to be! I love the color you chose. I am a blue gal as well and use it a lot in our home. Love that dresser and the color is beautiful! 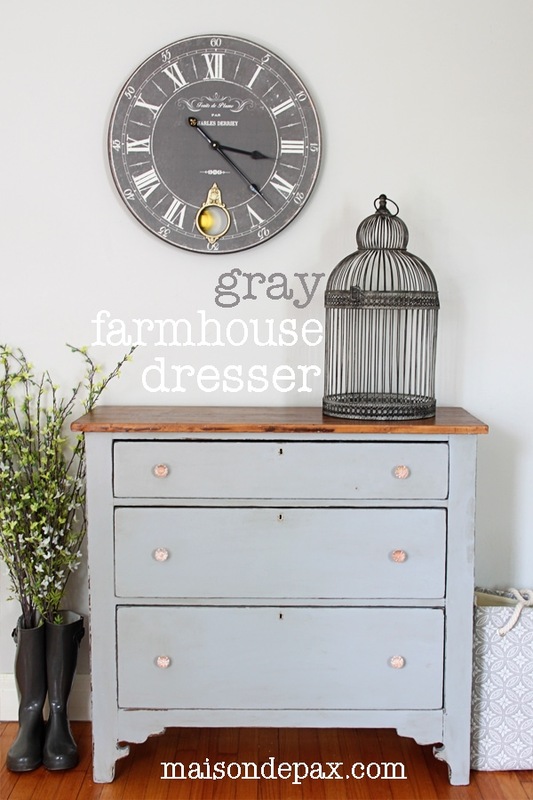 Gorgeous dresser….beyond fabulous job…I am going to search on where I can obtain this paint…Sounds amazing and such an amazing result! Just happened upon your blog and was impressed with your work. 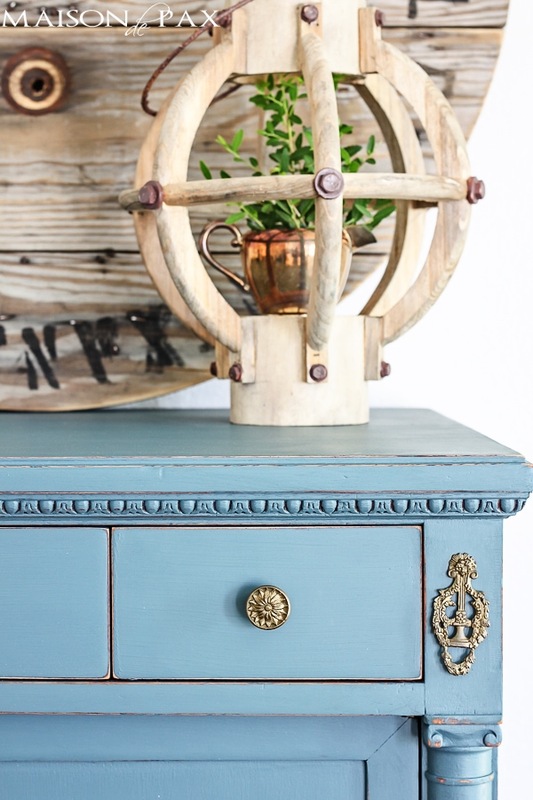 I love painting furniture and am going to have to try this paint. Keep up the beautiful work!